Mitch arrives on the square, and he is hunting down the Taylors. Ian returns with a fresh mindset. You going to move this van or what? -I'm going to get some breakfast, darling, you want some? You ain't going without a bit of bacon. She's proud of you. We all are. -I thought you had school? Mum, Phil's going to flip if I'm late. Keanu! It's a bit of bacon! Slip us an extra rasher? Hey, man, you got no chance at all. Yeah, but I'm a growing boy, ain't I? This young lady can see that. Since when did we do extra rashers? Oh, it's to shut him up. I was going to do you a nice bit of breakfast. -You're chucking our money away! -He shoved petrol through our door! -And if he does, the alarm will go off. -You're scared. I get it. -Don't make this a joke. I'm just saying he's not coming back. Trust me, baby. Yeah? You break anything, and you pay for it. And don't wear your breakfast. If today ain't my day, it will never be. You got buff, son! Come and give me some love. -All right, see you, Marie. Thanks. -What is that on your face? You gone all hipster on me or something? No, I just thought I'd try something new. Well, don't try it for too long. -So, don't you want to go to sleep? All the way from New Zealand? Yeah, and what about Simon? Did you see Simon? They give you this magazine, you know, when you fly business. -It was all about the key to success. The past is in the past and it must stay in the past. The future is for the making and today is the day to make it. so they end up where you can drive on the left and it looks like Wales. -Yeah, and I'm not going to end up like that. That's where they shot the Hobbit. I am no-one's Hobbit. I'm going back to where I'm best. All right, I've even learnt a Haka. OK, if I do it every morning, it gives you focus and determination. I'm like a glacier. And I mean you should see their glaciers over there. I mean, nothing is going to stand in my way. You'll have to show me this magazine. -Tomorrow is today and today starts with the chippy. -I've had a flat bed. I'm not tired. -"Rudeness is a short cut for fools." -I ain't ordered a lecture. I ain't ordered anything yet. ..when she's had her morning motivation. so maybe tomorrow can start in here? I knew you couldn't cope without me. I can hardly put the kettle on. Right, young sir, what can I get ya? I was working out a move. Do I look like a horse? You should put a bet on. -Six to one. It means it's rubbish. Means it's a good return. You want to bet on things where you can control the outcome. You should be saving for Australia! I never said I was the one playing. Boy knows his stuff, like watching a surgeon go to work. Think it could be a leaking slave cylinder. He'll have it done for you this afternoon. -He, um... He ain't from Aidan. Lot of tension around here, eh, son? Well, they will do, if I ever get to work. He, er... He doesn't know. He wasn't even happy with me giving you the job. No, I was just a bit economical with the truth, that's all. Yeah, well, I won't have him ruin my business. I'm not scared of your son. Yeah, well, he won't even notice I'm there. If you want a reduced price, you can have yesterday's. Nah, he don't like tomato with his cheese. -Give us a bun instead. It's his first day with Phil. Oh, good luck to him. Oh, Kim. As sharp as ever. He's been in bed all the way. No, not in bed. Had a bed. And Kathy's got you working already? Respect to the woman. Gone to see a supplier. And respect to the samosas! Have you been to the chippy and tasted 'em? Full of flavours. but some geezer said your mum had moved around here. Yeah, they moved on again since. Couldn't believe it when I saw the towers all boarded up. I thought, "How am I going to find my princess now?" You know? And then, my clutch went, I find the nearest garage and boom! I mean, come on, this is what you call fate. -I'll nip off until you've finished, yeah? So, there's no point you sniffing. All right, son. That's cool. Give us a call when you're done. I've only been playing a few months! It's like taking sweets from a baby! You know, man, I've got a new woman, you know? Brought the worker a sticky bun. but I got caught by a stubborn stain. Yeah, you need to go, all right. So, how's the morning been? Mum, Phil don't like people coming here. Yeah, maybe I got a car that needs servicing. And maybe you can't drive. Look at you, in charge of a garage. Oh, come on. I've just bought my son a treat for his lunch! All right, stop keeping me from my dryers. -Jumping at shadows, am I? No, my son's not abrupt. "What are you selling foreign food in here for?" "What you selling foreign food in here for?" No, you come round here and be me. -how we were going to persuade him? -OK, this is how it goes. "We sell chips, Masood. And fish. "This is a chip shop." why he's not going to kill the pair of us. 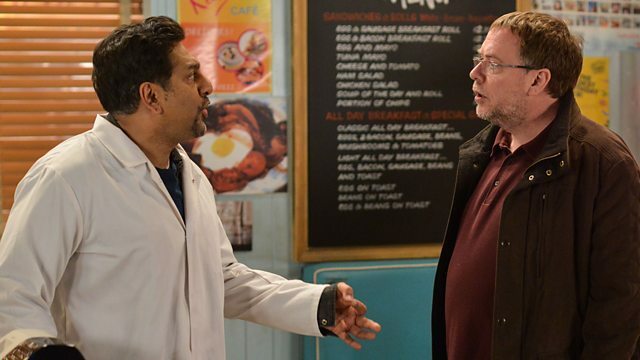 "Is this called Masood's Plaice? "No. It is called Beale's Plaice. "The Plaice of the Beales. "and British vinegar to find..."
-She found me on the internet, you know? Now, what you want to go to Australia for, then? -What, the impression or the samosa? Oh, no, the impression was on purpose. So, how can a samosa be a mistake? -Whose side are you on? No, I never said "pig-headed". Right, so, this samosa, it just dropped itself in the fryer, did it? -Yeah, which they go to the curry house for. Because the curry house is shut, because the owner was so incompetent. What? And you went behind me back. Well, you were busy off being a glacier! -I thought you was all about adventure now? -In a world that didn't look like Wales? -Just look at the books, Ian! -Yeah, I will look at the books. I'm going to look at about how much I'm paying you. I could've started this again on the market. Yeah, right my business, my decisions. You keep going on about these profits, what profits? Could I have a couple of samosas, please? Oh, a couple of samosas, sir? I'm sorry, we're actually a chip shop. I don't pay you to stand around, Masood. I never made you lose your money. -Oh, yeah, course I can. You just care about your 50 quid. I just brought you some lunch, kid. -So, how's it going? We winning? Getting there? You're charging me by the hour, boy. You'd know all about that, wouldn't you, Mitch? Look, I got this new job, yeah? They're putting some flats up by the docks. I could ask around, see if they need any labourers, or whatever? I'm well in with these guys, you know? Learning fast. I'll be a property developer soon just get a couple of houses. I just gotta get the finance behind me, you know? -Yeah, well, we've not got the money, Mitch, all right? I'm glad you're doing well for yourself. I always said you should get a trade. Could you check this tyre for me? It's a bit bald and it's an easy pull, please? Girlfriend, eh? You ever see Kandice, eh? Yeah, yeah. And your sister? I was talking about Chantelle? Has Mum got a fella? Yeah, well, she hates your guts. -You can't stop me from finding her, son. HE LAUGHS Ain't you sacked yet? cos she wants to get some chicken and celebrate. -Come on, then. Show us your new toys. -Have you got a grinder in there? -You can't, Phil's in a bad mood. All right. Chill out. Mum sent me. I told Chaconia I'd be online. Chaconia? What sort of a name's that? Few more miles for your Australia fund. I said I believed in you. Had a good teacher, didn't ya? I don't want to see you again, Mitch. You can't escape fate, son. Say hello to Mum, yeah? Did he pay his bill? Must have been Lady Di. I think you spelt my name wrong. There's no B in Masood. Do you know how I start my day? Have you ever flown in a flat bed? I really missed this, you know. Running a business with you again. -It was better with Jane. Yeah, but Masala Queen was good. When I just made chips for you, I worked for you. OK, you finessed this idea whilst you were an employee of Beale's. -Yeah, but you don't own my head! the intellectual property rights to all of the samosa business. I agreed a 50% stake with your mum! -Cooking is in your job description. -I don't have a job description! No, at the rate you are currently being paid. While you fly around the world in flat beds? I could discipline you for cooking off-menu items. Well, at least we know it works. I just thought I'm still here. You're not the only one who's jumping at shadows. But, like you said, there's no-one there. No. We get scared, we talk. We remind each other that it's over. You have got two minutes to get back in there. -He's trying to steal my business! She didn't have the authority to make the decision. Oh, and who did, then? The man in the flat bed doing the Haka? -No! It's a chip shop! -Where do you think fish and chips come from? -They're as English as hot dogs! -Ian, you need to calm down. -Yeah, do as Mummy says, Ian. He wants a share of our business! -Which he has been expanding. Which I have paid into! This is about you missing Jane, isn't it, Ian? Jane's moved on. So have I.
Ian, I think we should all just calm down. She was always too good for you. You may end up being rich, Ian. But you will always be alone. And samosas, they are my intellectual property. Hardly a horse's head on our pillow, is it? Well, didn't go off when you put it in there. One of his little games, a message. -Yeah, then we deal with it. Ain't he heard of a text? I forgot I ordered it. I love you, Linda Carter. Well, you are going to have to love me later. Because we've got a pub to run. I thought he was going to sack me an' all. And he didn't sack me. I quit. Yeah, well, it was fun, wasn't it? While it lasted? You know they're from Iceland? I'm not in the mood, I've just got off a flight. You should try a flat bed. You, um... You got any samosas? Do you know this plank, Mum? -I thought you were just passing? Do us two small cod and chips, please. -I used to have a job. -You used to have a job. -Here, what are you smiling about? -She's after that last bit of chicken. This year's turning out to be proper cushty. Any of you fancy finding Jesus? -You know, they'll get bored. Oi, Keegan! Your brother's eating. Ask 'em why dinosaurs ain't in the Bible. -I thought you did a runner? I totally forgot, mate. Look, there you go. You...you followed me home, didn't ya? It's a big house for just one person? -Get back in your van and go! -I'm not going to tell you, Mitch! Eh, you ain't changed a bit, girl. What's he doing here? Unless he was recruited by Jesus? -You knew he was about, didn't ya? -You're not going to do this again. Ain't you going to give your old man a hug?